When two giant six lane roads dissect your neighborhood, sometimes it’s hard to find your identity. But with Overland, this community has managed to find a way to stay connected in west Denver. Blocked in by the Platte to its west, Broadway to the east, Mississippi to the north and Yale to the south, Overland’s got a narrow but interesting geography to tackle. 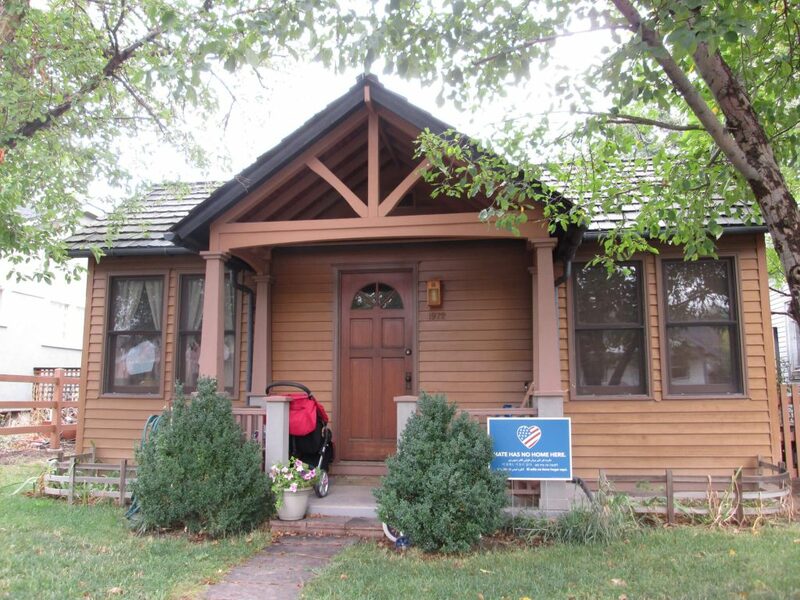 What started as Montana City, the first platted city on the eastern slope of the Rockies, then became the City of South Denver, and ultimately Overland, this area has had its share of history. 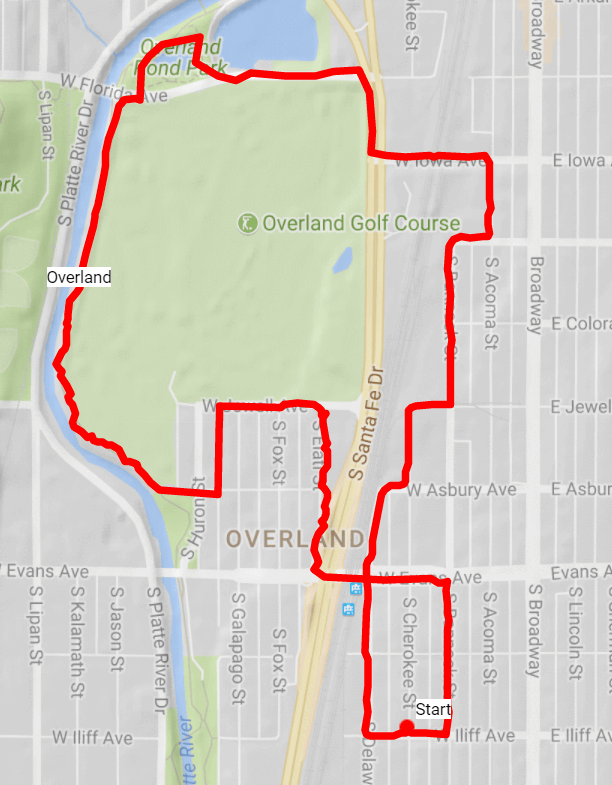 A gold strike followed by famous rail lines, a city full of the rough and tumble troubles of a frontier town, and then a town that wanted to clean itself up, Overland has had a race track, a Superfund site, and even the beginnings of the Denver Country Club. Transit-Oriented Development and a Fun SoBo! 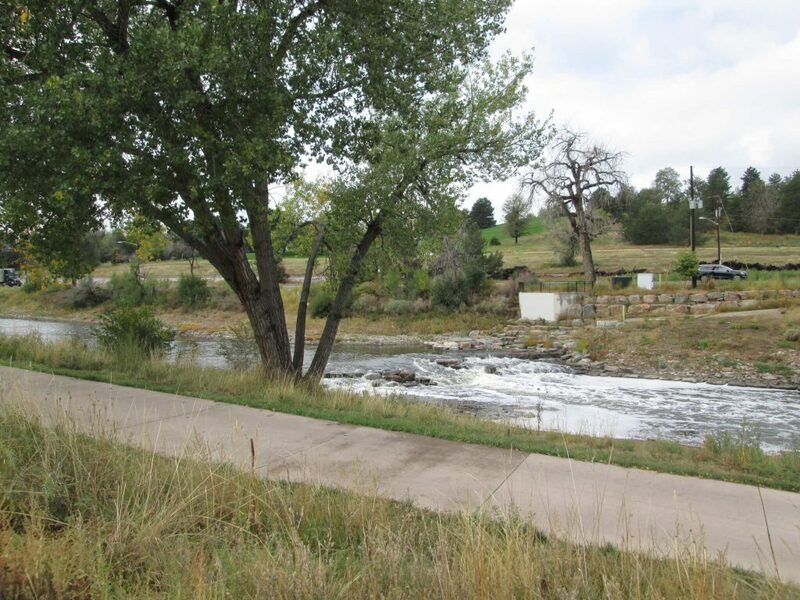 While trying to walk the boundaries of Overland can be difficult and it takes a little imagination to cross Santa Fe and Evans safely, there’s a great urban hike just waiting to be walked. We ambled through industry, commercial, rail, trails, paths, sidewalks, homelessness, and urban areas all along our 3.5 mile walk. It’s an adventure more than an amble with plenty of interesting art and views along the way….kinda rough and tumble like Overland’s history. Start at 2303 S Cherokee St. Go west to S Delaware and head north. You’ll pass the Evans light rail station. 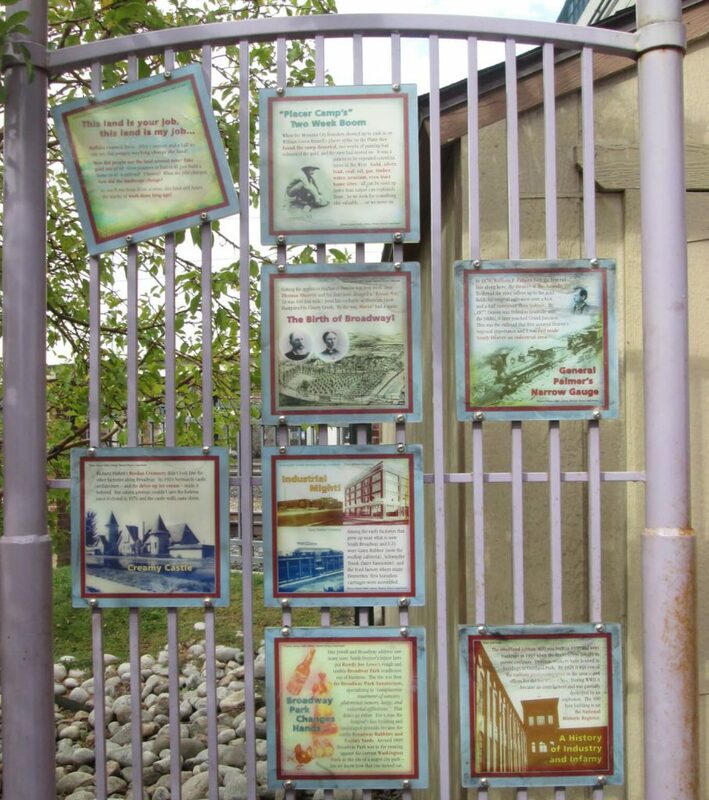 Be sure to read the signs about Overland’s history, pointing out famous buildings and landmarks of yesteryear. Continue north under Evans, take a right on W Ashbury, then a left on S Cherokee, right on E Jewell, a left on S Bannock, a right on W Mexico Ave, a left on S Acoma St, then a left on W Iowa. Be sure you’re on the north side of Iowa to walk the sidewalk under the light rail. Cross over Santa Fe at the light, then turn north on Santa Fe. Walk parallel to the golf course. At W Florida, cross over Florida then take a left. You’ll pass the Aqua Golf then see a path into Overland Park. Go north on the Overland Park path, taking you through the park, rounding yourself around to the west, looping through the park. You’ll end up back at the intersection of Florida and the Platte River. Cross south across Florida onto the Platte River trail. Continue south between the Overland Park golf course and the Platte River. At W Ashbury, take a right. Take a left on S Galapago street, enjoying this quite little neighborhood tucked into Overland’s corner. Take a right on Jewell. Take a left on S Elati. Go under Evans, then take a u-turn up onto the Evans overpass. Notice the great fish painted along the sidewalk barrier on the north side of the street. At S Bannock St, take a right, then take a right on Iliff, returning you back to your start.